This page covers 5G Protocol Stack i.e. layer 1,layer 2 and layer 3. The 5G layer-1 is PHYSICAL Layer. The 5G layer-2 include MAC, RLC and PDCP.The 5G layer-3 is RRC layer as shown in 5G protocol stack. 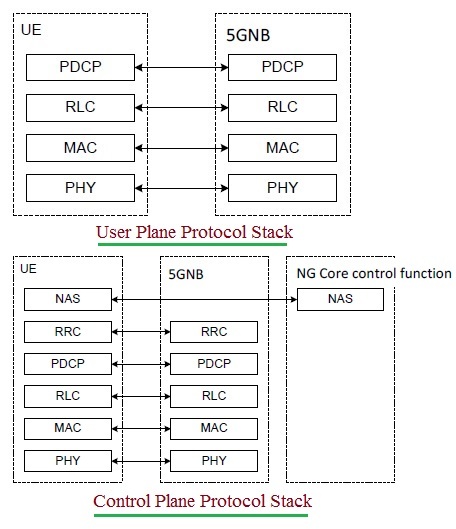 The Figure-1 depicts 5G Protocol Stack consisting of both User Plane and Control Plane protocol layers. Following are the functions of 5G layer 1 i.e. PHYSICAL (PHY) Layer. 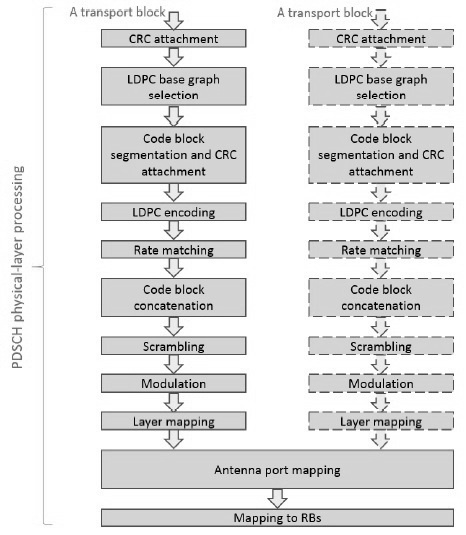 Refer 5G NR PHY layer >> which describes processing of PDSCH and PUSCH channel through PHYSICAL layer modules as defined in 38.200 series documents. Following are the functions of 5G layer 2 i.e. MAC sublayer. Following are the functions of 5G layer 2 i.e. 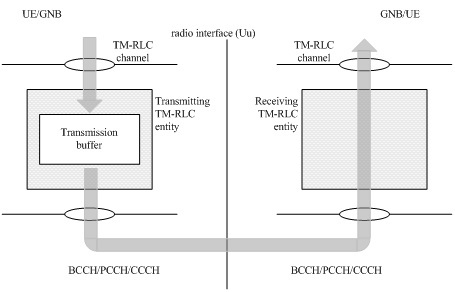 RLC sublayer. Following are the functions of 5G layer 2 i.e. PDCP sublayer in user plane. Refer 5G NR MAC layer overview >> for more information on 5G NR MAC functions, 5G NR MAC architecture, 5G NR MAC channel mapping, 5G NR MAC procedures and format of 5G NR MAC header and subheaders. Refer 5G NR RLC layer overview >> for more information on 5G NR RLC modes (TM mode, UM mode, AM mode), data structures (TMD, UMD, AMD), RLC PDUs (TMD PDU, UMD PDU, AMD PDU), data transfers (TM, UM and AM) and RRC parameters which defines RLC layer. Following are the functions of 5G layer 3 i.e. RRC Layer. • Broadcasting of system informations to NAS and AS. • Establishment, maintenance and release of RRC connection. • Establishment, configuration, maintenance and release of point-point radio bearers. • Refer 5G NR UE RRC states >> and their functions and RRC IEs >> (Information Elements) used in 5G NR UE/gNB and 5G NR system for various purposes.